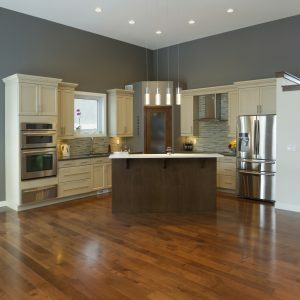 Pre-finished or flooring finished on-site, which works best for you? Pre-finished hardwood is quite popular among homeowners everywhere. Hardwood flooring is easy to maintain, and doesn’t really show small damage. Pre-finished hardwood flooring is great because half the work of the installation is done before it even leaves the factory. But when you purchase un-finished flooring and have it finished on-site, you get the added bonus of seeing the finish applied to your flooring and added reassurance that it was done right. One of the biggest advantages of pre-finished hardwood is that it is pre-processed by the manufacturer. Before the product is sent out, it is fully sanded and finished. When pre-finished flooring is installed, all the contractor has to do is cut the boards to the correct size and glue or nail them down. While it may seem cheaper to go pre-finished up-front, you don’t know for sure that the manufacturer used the highest-quality finish they could. With an on-site finish done by a reliable, professional contractor, you know you’re getting a high-quality finish. Along with being incredibly durable, pre-finished hardwood can sometimes be more aesthetically pleasing as well. Factory-applied finish tends to have a more uniform look to it. Sometimes, finish applied on-site can get bubbles in it, which not only makes it look bad but can make an otherwise smooth floor feel rough. This just means that if you do choose to have your floors finished on-site, you should make sure you work with a qualified professional like Jason Brown Wood Floors. While the wood’s color and grain patterns are determined by the grade, quality finishing can make a rather large difference in the appearance of your floors as well. If you like the warm ambiance of hardwood but you still want your floor to have a smooth, glassy look, then and on-site finish with a high-gloss product is the way to go. There really isn’t much difference between pre-finished and site-finished flooring with regards to usage and maintenance. Although, you do need to wait for site-finished flooring to dry before you walk on it, that is a small price to pay for the smooth, consistent surface. Since pre-finished hardwood is already finished when it gets delivered to your home, once your flooring contractor is done securing it with either nails or glue, you will be able to walk on it. Ultimately, the choice of pre-finished or on-site finishing is totally up to you. Whichever flooring you choose, you can trust Jason Brown Wood floors to install a beautiful floor that will last for years to come. This entry was posted on Thursday, October 5th, 2017 at 5:12 pm. Both comments and pings are currently closed.